It seems like the perfect "olive branch" to extend as my apology for being blog-sent (absent) for so long. And truthfully, while it has only been about 2 weeks since my last post, it feels more like an eternity. Thus, besides dealing with the frightening reality that the Bar Exam is looming over my head, I also have to start seriously contemplating how I'm going to find a job to pay back the ungodly amount of loans I've amassed over the past 3 years. Basically, this is scary, scary stuff. But enough about why I've been gone, let's just talk about the food. In my opinion, there is (and always was) something undeniably cool about a dessert called "Puppy Chow." When I was little, classmates would bring it to share on their birthdays, parents would make it for bake sales, and my friends and I would bark and act like puppies while eating it - how could we resist? Now that I'm older, I appreciate Puppy Chow for it's sheer simplicity. Not only does it contain the perfect blend of peanut butter, chocolate, and crunch, but it also tastes great warm or cold. Plus, it only takes about 15 mins to prepare, and you don't even have to turn on the oven or stove. Mmm-hmm, I can definitely wag my tail to that! 1/4 c. Earth Balance "butter"
1.) Put cereal into a large bowl & set aside. 2.) Place chocolate chips, peanut butter, & Earth Balance in microwave safe bowl. Microwave on high for 1 min. ; stir. Microwave 30 sec. more, or until chocolate mixture is smooth. 3.) After mixture is melted, stir in vanilla & pour over cereal, stirring until coated. 5.) 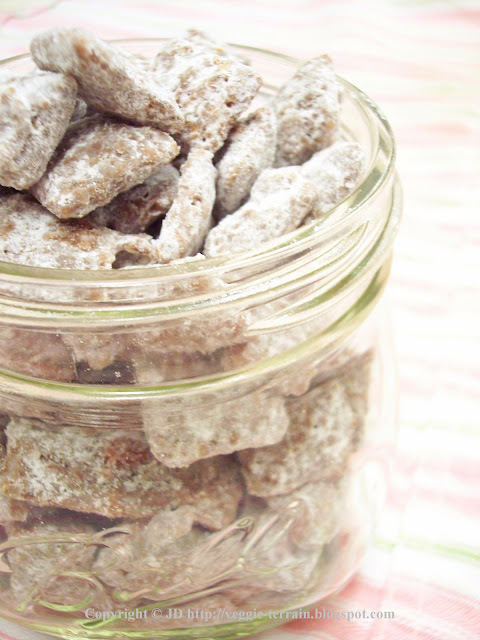 If desired, pour Puppy Chow onto wax paper to cool. Serve immediately, or store (tightly sealed) in refrigerator. Wow. That's such a neat idea. They look great! Awwww cute puppy face. I've never heard of this before! I'll have to give it a go. Chocolate and peanut butter are a match made in heaven. I love puppy chow! It is so perfectly delicious. Never thought I would hear myself say this... but I want some puppy chow! Best of luck with you last semester in law school! I'm sure you will rock your bar exam. Oh man, I know exactly what you mean about loans and jobs! I've been having a reoccuring dream where I'm at the bottom of a mountain watching an avalanche come rushing towards me- thats about how I feel about student loans. Anyways, comfort food always helps! Particularly chocolate. I'm going to make this right away. Oh, my goodness! I'm so excited to see this recipe! Puppy chow discovered me for the first time last year, and I've forgotten about it since. Thank you for refreshing my memory! GASP. I love that stuff. I need to pretend I didn't see this recipe or I'll make it and eat all of it in one go.